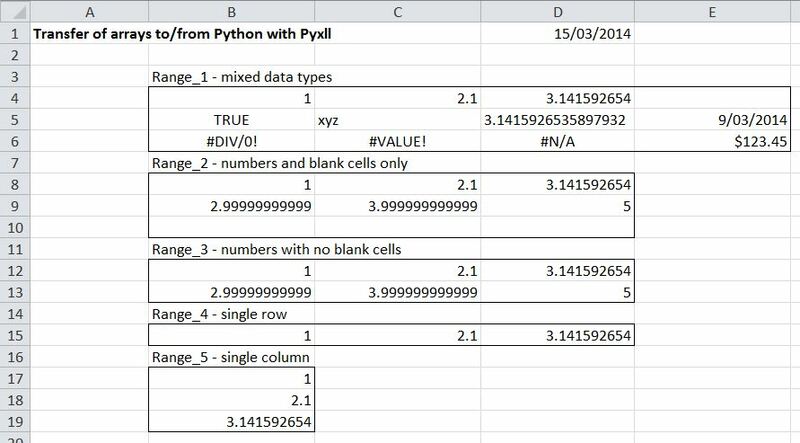 This post will look at options for transferring arrays between Excel and Python using Pyxll, including data types, and problems associated with transferring mixed data types. In the following post I will look at the relative performance of the various options when used with a large range, which shows some big differences. Range_1 includes numbers (in different display formats), text (including numbers in text format), blank cells, and a variety of error constants. Cell D5 contains a text string showing the value of pi to 17 significant figures. Range_2 includes just numbers and blank cells, and Range_3 just numbers with no blanks. 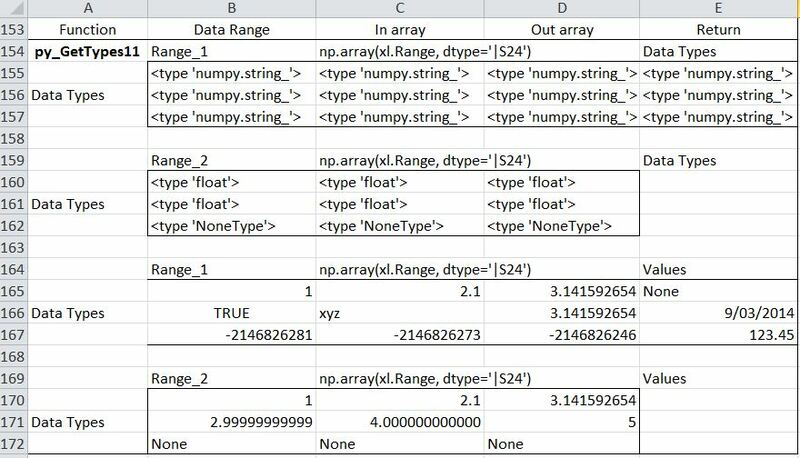 Range_4 and Range_5 are a single row and column for use with the Pyxll numpy_row and numpy_column data types. The @xl_func decorator specifies the data type for the input function arguments, and the return values, which may be a single cell value or a range or array in both cases. Using Range_1 we see that all cells with numeric values are passed as ‘float’, including date and currency values. Blank cells are passed as ‘NoneType’, Boolean as ‘bool’, and text as ‘unicode’ (in Excel 2007 and later). The error constants are passed as various types of ‘exception’. The text string version of pi is returned as text, including all 17 significant figures. This string will be recognised as a numerical value by Excel, but the additional significant figures will be lost. Pi()-D31 will return exactly zero for instance. Note that the blank cell is returned as a value of zero. """returns a Dispatch object for the current Excel instance"""
# as otherwise things like constants and event handlers won't work. Note that in this case the VBA function passes just a string with the range name. Numbers formatted as date or currency are read as ‘time’ and ‘decimal.Decimal’ respectively. In this case Range_1 will generate an error because it contains non-numeric data. 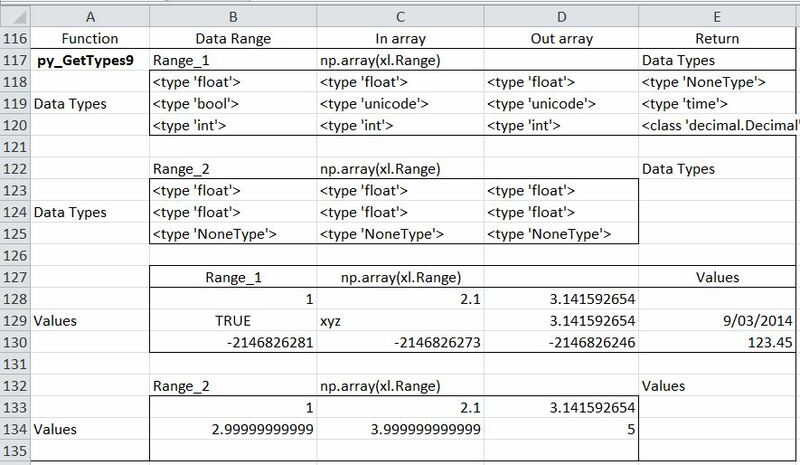 This entry was posted in Arrays, Excel, Link to Python, VBA and tagged Data types, Excel, Python, PyXLL, VBA. Bookmark the permalink.